wow…For the Freedom and efficiency I’d still be good going for smaller Tiny Home even if it is more per square foot. Great post. Thanks Regina! It’s amazing with all the windows and light that shines in, the high vaulted ceilings and the efficient use of space how spacious and functional these homes actually are – feels like you’re living in a space 3-4 times the size! For twenty years now I have lived in a 537 square foot bungalow and love it!!! Maybe build them this size too because it is big enough. Even though it cant be moved it feels liberating. When I bought it, it had to be repaired and it was a mess and took some time to bring it back but well worth it. There were times when I wondered what was I thinking when I took it on but I was determined to do it because I knew it would be worth all my hard work and most of all I wanted people to know that there was a better way to live and it the freedom that living more tiny bring. I often wondered why there wasnt more of them around and was determined to be part of something truely special in living a better way!!! That’s awesome Sandy, thanks for sharing! There are more and more around, people are starting to figure it out and really get the many benefits and freedoms of going Tiny. I don’t think the quality of tiny houses are that much better than traditional construction. Certainly not 4 to 8 times better as the cost reflects. Hey Deb, anyone can build a tiny house, so in that sense yes, quality isn’t necessarily that much more. 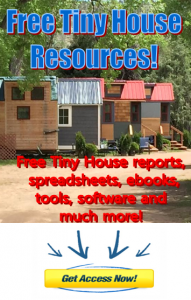 However, for the amount of savings that can be had with a tiny house, you can certainly dramatically increase the quality of the materials and the overall build for relatively no money (compared to what it would cost on a much bigger, traditional house). Also keep in mind, these homes are typically better insulated than a normal home and are made to drive on the roads and as such are subject to a lot more wind and cross currents than most homes would normally encounter on a regular basis and are built up for that reason.